WINTER formed in late 1988 and are based in the New York City/Long Island area. Together they draw from varied musical influences and backgrounds to create what is WINTER. One of the originators of modern doom/death metal, they played extremely slowed down death metal leading the exodus from a widely held fixation with fast metal riffs. 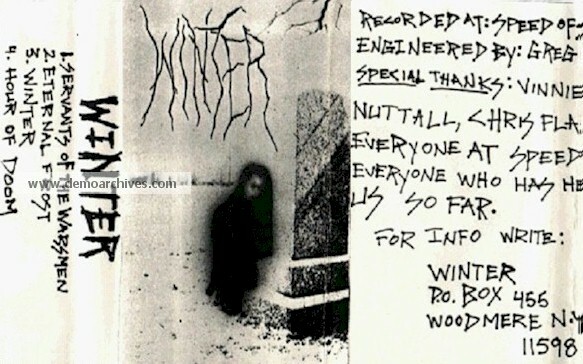 Winter is one of the hardest to digest Doom acts due to the oppressive nature of their songs. Recorded on regular tapes with Xerox three panel covers. Another pressing had the same covers but the tapes had printed stickers on the shell.